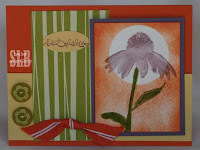 I did this card for a challenge by fellow demonstrator Jan Tink. The challenge was three fold. We could to them all separately or do them together. I chose to do them all together and it was a challenge! The three parts were the sketch, color combo (Kiwi Kiss, Tangerine Tango, So Saffron, Perfect Plum), and technique which was moonlighting. I'm fairly pleased with the results and have to say that when I first read the color combo I didn't think I'd be able to do it. But, it's not too bad! All products are from Stampin' Up! Great use of this stamp set! You did a great job with the color combo also.